Casa Hibiscus €" a modern, semi-detached holiday villa €" is situated in a well-maintained, private and gated complex of six holiday homes, which share a 3.5 x 5 meter solar-heated swimming pool. 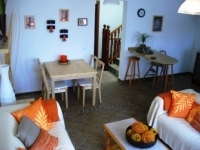 Set just back from the sea in the traditional Canarian fishing village of Punta Mujeres, the holiday villa has been individually furnished to a high standard with families in mind, sleeping up to six guests, plus cots. Casa Hibiscus can be rented alongside the smaller Casa Lila, which is next door but one, making it perfect for families or friends travelling together.